Record breaking monsoon rains have killed at least 1000 people and left tens of thousands marooned and homeless in the north west of Pakistan. Over one million people have been affected by the worst flooding on record. Officials fear the worst is yet to come if the flooding hits more populated areas and disease breaks out. The full extent of the damage remains unclear as many areas are inaccessible. The people of Pakistan urgently need outside assistance. ACT Alliance has an initial 3 month appeal for US$1.6 million but more will be needed. Please give generously. Floods since 21 July have destroyed homes and washed away livestock and food crops. People need food, clean drinking water, shelter and health assistance. CWS partners are already in the area providing initial relief. Some had to be rescued from their own flooded offices. Now they are distributing plastic sheeting for temporary shelter and food and have mobile health clinics in the area. 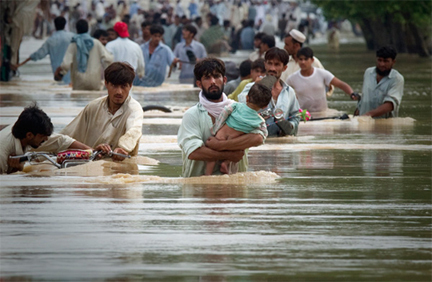 The monsoon season affects Pakistan between the months of June and September. Current weather predictions indicate that continued rainfall may worsen flooding in Pakistan as well as prolong and expand the emergency situation throughout the country.